When a culinary experiment goes well, a food blogger gleefully does a victory dance in the kitchen and a genesis story of his/her new success gets blogged about — as to be expected. In the case of a kitchen experiment gone awry, a food blogger still retells the story albeit with less enthusiasm. But when a failure is not just an ordinary failure but one of epic proportions, a food blogger finds solace in a classic poem. Emily Dickinson’s “After Great Pain a Formal Feeling Comes” describes how the mind preserves itself following tremendous anguish by going into stupor and stays there until it finally lets go of the pain. First chill: It happened on a lazy afternoon. Still excited about having made some really good gelato, I decided to do another ice cream experiment. I caught a glimpse of a bag of frozen green peas nestled between a bag of pomegranate seeds and a bag of hazelnuts and remembered the petits pois ice cream I once had in France. Overestimating my ability to think rationally, I decided to pop the frozen peas, along with some homegrown hydroponic mint, into my Vitamix. The fine pea purée was mixed into the plain gelato base, then churned and frozen. Then stupor: After a quick siesta, I decided to check on the gelato. A plume of sulfurous smell billowed out as I opened the container. In an attempt to convince myself that the taste was usually better than the smell, I took a bite. The sun went out and a heavy silence befell the entire house. I found myself standing there, deaf and dumb, with a spoon stuck in my mouth. The concept of this ice cream may be French-inspired, but its taste comes straight from Hades. Then the letting go: What else could I have done? Into the trash can it went. I love how you linked the green pea gelato to Emily’s wonderful poem. A wonderful mix of art and anguish! 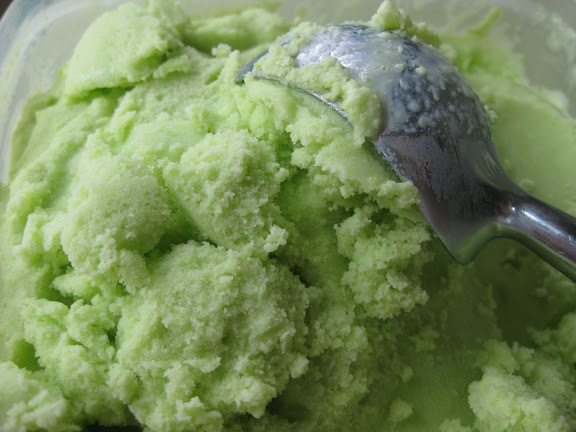 I find it hilarious that you attempted to make pea ice cream and were surprised that it tasted awful. Duh! Thanks for becoming my Foddbuzz friend, so I just buzz’d you hope you did me lol. Ricardo – Thanks a for a visit. I think I will try to rein in the adventurous spirit a little more next time. The green pea ice cream I had in France was good, though. This means the concept isn’t too crazy, but the execution was obviously flawed. I need to do an autopsy on this gelato to figure out what I did wrong. I love the sense of adventure in trying out pea icecream and contrary to Roger, think it might not taste so bad – some of those Filipino desserts come to mind with corn and beans that are tasty but not what Western tastes are used to. Sorry to hear the exeriment was a disaster but please do not loose hope! haha! i totally laughed out loud. normally when i read something humorous i laugh, but only in my head, but your last sentence was so good my laughter actually erupted out of my mouth!